Not to blow my own horn, but I am normally quite good at planning where to eat on holiday. I study guidebooks, blogs, websites; I plan itineraries around this fried fish joint in Malaga or that Souvlaki place in Rhodes. I go back home comforted by the thought that yet again, I have eaten and drunk everything worth eating and drinking. Of course, in a city like Tokyo, this is impossible. Not only because the city itself stretches over a surface of over 2,000 square kilometres, but because it has the highest concentration of eating venues I’ve ever experienced. There are no-frills counter seating eateries, Michelin-starred restaurants, bakeries, yakitori joints where beer and sake are drunk around the griddle, izakayas where the food complements the drinks, noodle places with their little vending machines from which you order, performance restaurants, street stalls, markets. And all these seem to all sit on top of each other, there to confuse you with enticing smells and Japanese-only menus. On top of this paralysing choice, Japanese addresses are near-impossible to understand and Google maps can be a little useless. At times, we would circle a road for a while before giving up, baffled at the fact that Google Maps had promised us that the restaurant would be there, on that very road, but was nowhere to be found. Some of these places remain a mystery; others, we realise, where simply inside buildings: there seem to be a number of buildings which only house eating and drinking places. Finding what floor the place you want to go to is, is a whole different story. So there was a lot of improvising, and a lot of restaurants whose names I could not note down, where we stumbled upon hungry and frustrated after not been able to found the supposedly great okonomiyaki place round the corner. They were all truly great. Kombinis, convenience stores, adorn every street corner and they are so wonderfully Japanese, you could forget they are American chains. The ready-to-eat foods are cheap and lovely: fat onigiris filled with anything from grilled salmon to fish eggs to sour salted plum (umeboshi, my favourite). Katsu (cutlet) sandwiches, in the whitest, crust-less bread, and ready-to-eat soft boiled eggs. You can also buy all sorts of snacks and crisps and bakery items. Sweet melon pans (covered with a cookie crust which makes them look like melons), buns filled with red bean paste, airy baked cheesecakes, chewy chestnut mochi. The drink section also features pretty much everything you can think of: cold green teas, sugary milk teas, flavoured milks, sodas made to taste like yogurt, cold beers and cans of sake. If you’re every hungry and confused, a kombini will see you through. Japanese bakeries, the takeaway kind, are very similar to the ones you get in Chinatown in London. You take a tray and a pair of tongues at the entrance, and fill your tray with all sorts of cakes and buns. I noticed that a lot of them appeared to claim some from of Frenchness: they had French flags or were called something along the lines of “vie de France”, but were about as French as I am Japanese. This is where I made a first discovery about Japanese food: there seems to be little interest for authenticity. 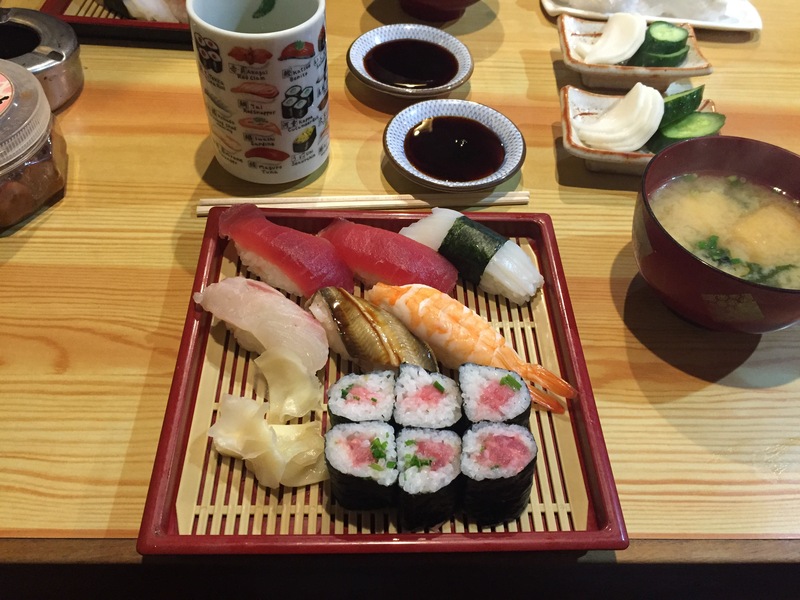 Foreign food is broken down to its elements and re-built to look and taste decidedly Japanese. A buttery, flaky croissant is chewed and spat out looking like a shiny, horn-shaped brioche filled with chocolate cream. This gives life to little treasures: buns filled with thick custards, but also turnip tops, matcha cream, chestnut; pancakes that are really soufflés and cheesecakes that are also really soufflés. 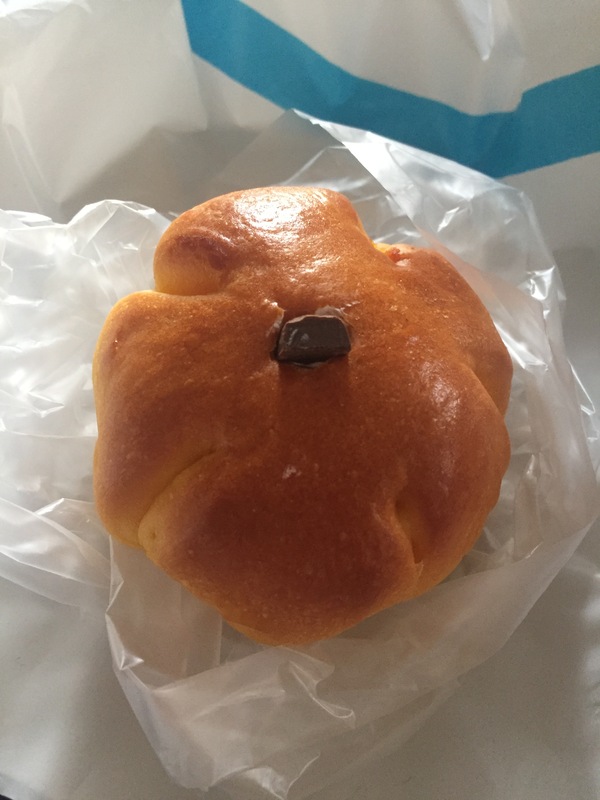 Below, a little pumpkin-shaped bun, filled with slightly sweetened pumpkin puree. Flavours are not overly sweet and often nutty and toasted, never particularly sharp. Seasonality also seems very important, as pumpkin, sweet potato and chestnut were colouring all foods and dessert in November. 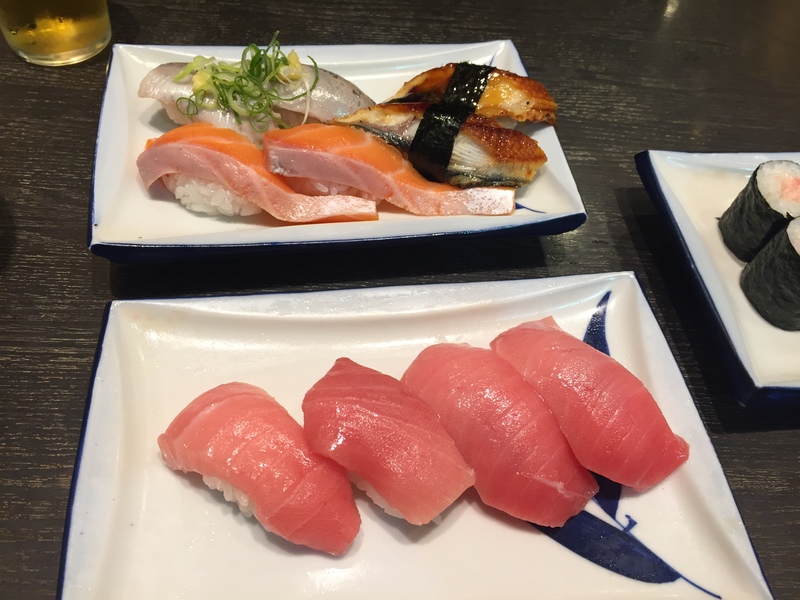 There were things I already knew to expect about sushi in Japan: it’s mainly nigiri and rolls are simple – the idea is to let the fish shine. Wasabi is in the nigiri and it’s not served on the plate for you to add. There is more emphasis on fish other than salmon and tuna. Then, there were things I really had no idea about. 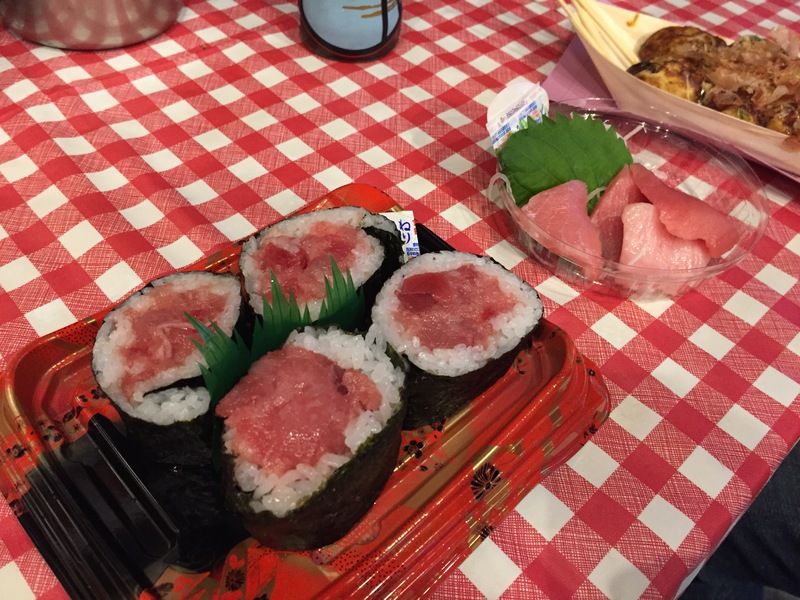 Tuna, especially medium-fatty and fatty tuna, seems to be one of the most popular sushi items on the menu. It’s much fattier than the purple maguro we’re used to in Britain, paler in colour, with a melt-in-your mouth texture. It’s dreamy. 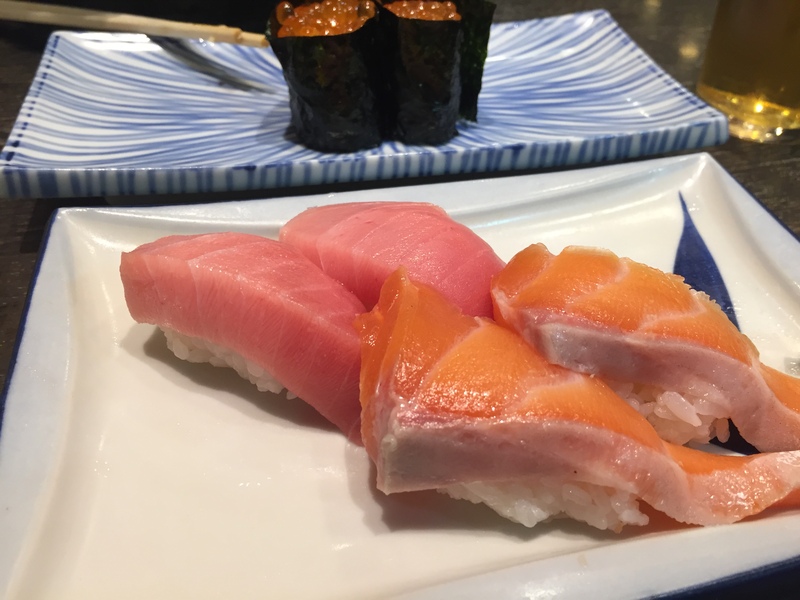 Salmon does feature in sushi menus, but it’s more often consumed grilled than raw. Here’s another thing: affordable sushi places don’t always look particularly nice. Used to the simple sleekness and abundance of wood of places like EatTokyo, some of the very popular sushi places I ate in were gritty, with servers wearing wellies, and chefs (politely) shouting at each other. There was often more of a fish-market atmosphere, and these places tended to normally have a queue and happy regulars wolfing down sushi with their hands (yes). 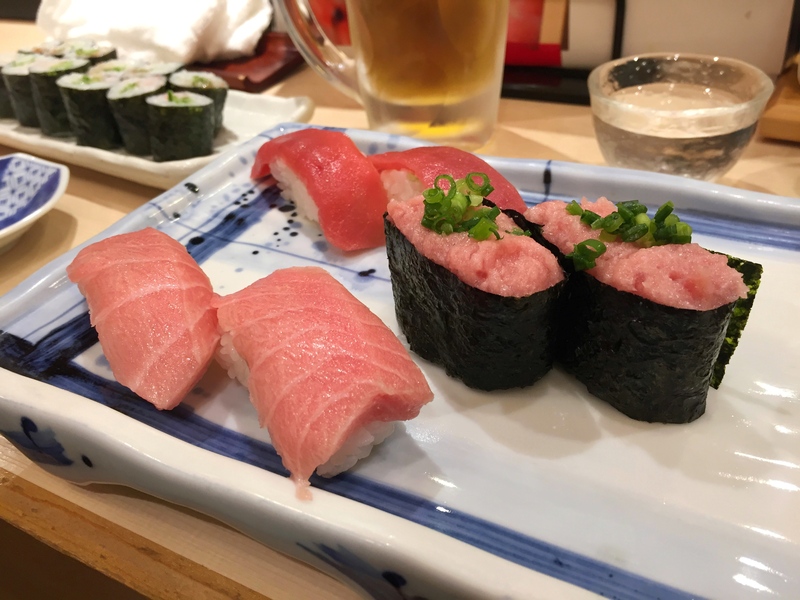 We stumbled upon this 24-hour sushi restaurant after discovering that a very good-looking izakaya had no English menu or pictures, which would have made ordering impossible. Kizuna sushi did a very good job of consoling us; it’s an airy restaurant with both table and (infinitely more fun) counter seating. The sushi was delicious and good value, and the atmosphere busy and buzzy. Their tuna set is excellent value and features tuna, medium-fatty tuna and fatty tuna, as well as scorched tuna and tartare. We also had slightly stranger rolls (slimy natto, of which I enjoy the nuttiness but was not quite as popular with my boyfriend), ume and shisho, unagi, ikura. The tuna was my favourite, draped over rice and so soft it was about to fall apart, it was delicious and a great showcase to what the simples of foods (fresh fish, rice) can achieve. Washed down with some dry sake, it was pretty perfect. A lot of the other sushi we had in Tokyo was in hole-in-the-wall places whose names I could not read. 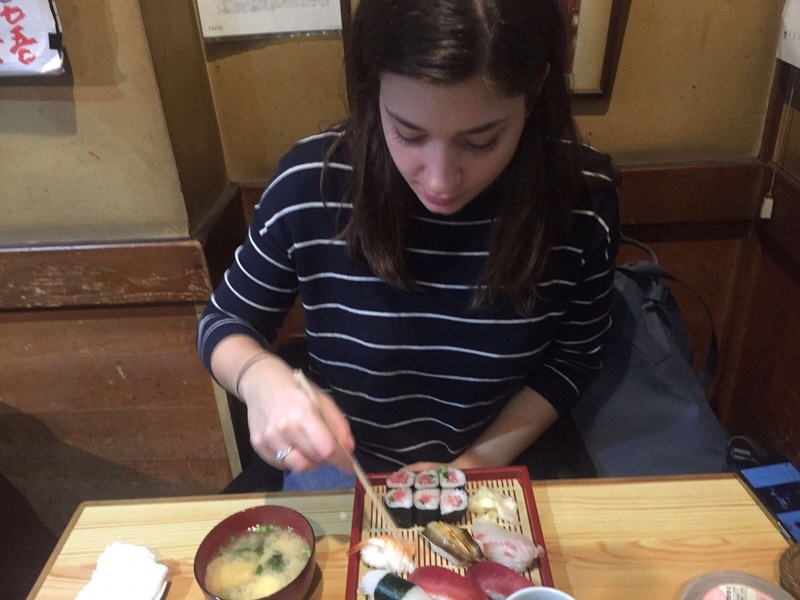 The one below was our first ever sushi experience in Japan. A tiny eatery in a subway station tunnel, where there was no menu and no English was spoken. The owner just asked if we wanted sushi, and we said yes. This lunch sushi set came to about 1,500 yen each – that’s about 10 pound. Locals were eating chirashi and miso soup and laughing at footage of Trump’s visit in Tokyo. 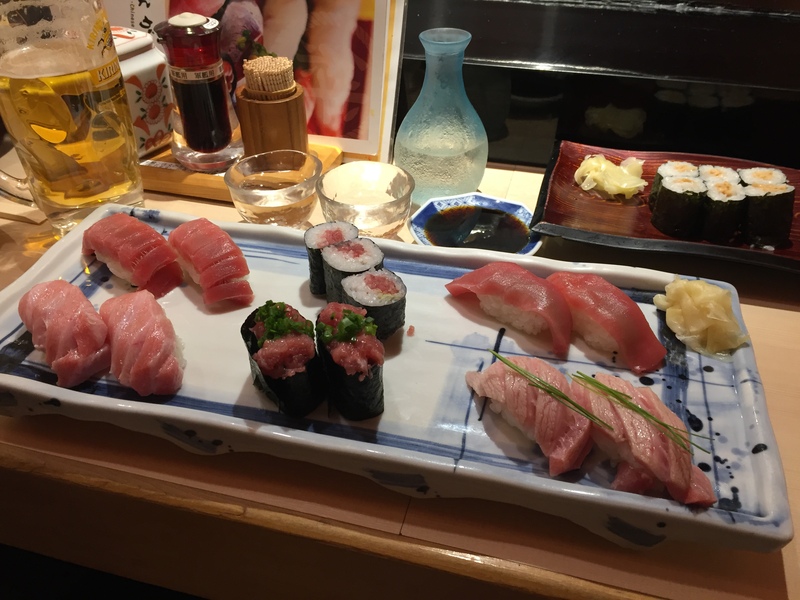 My absolute favourite sushi, though, was in Osaka. An energetic, bustling market frying up takoyaki, grilling scallops, selling wasabi roots and luxury fruit packaged like boxes of chocolate truffles. There is also a corner sushi stall specialising in tuna. There was lovely sashimi, but their rolls have set a standard forever impossible to meet back home: a never-before-seen ratio of fish to rice. I thought I wasn’t a big fan of ramen – I’m actually not a big fan of tonkotsu (pork bone) ramen. Its intense richness is a little off-putting to me, the way it coats the tongue and the vaguely animalic smells. But hey! 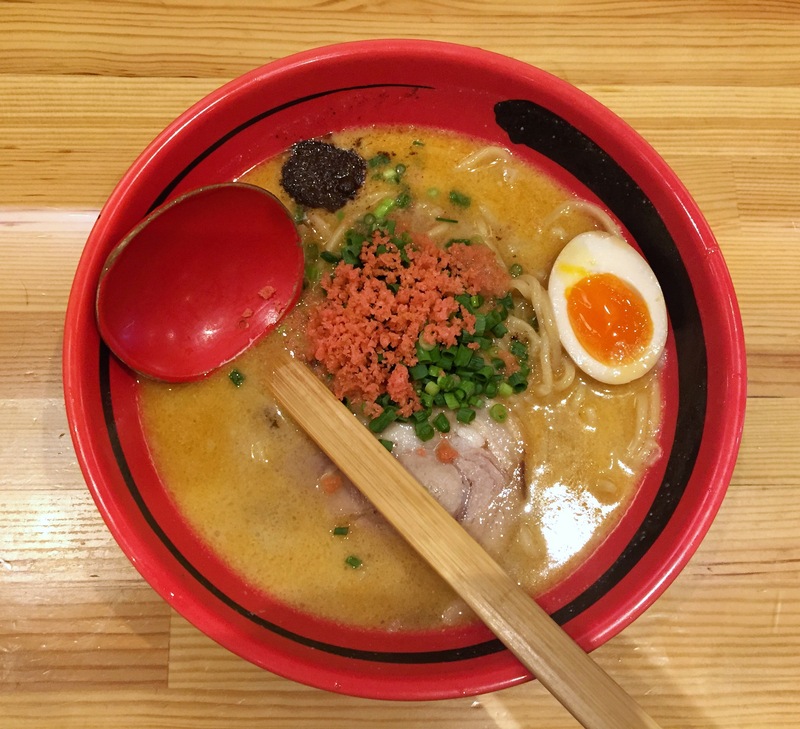 There is more to ramen than tonkotsu ramen. And even when it comes to tonkotsu, some restaurants will allow you to choose the level of richness, or to have your broth blended with miso or soy sauce. This place specialises in prawn ramen. The broth is intense and seafood-y, almost like a lobster bisque, and can be blended with simple soy sauce stock (my choice), or tonkotsu (the boyfriend’s choice). The ordering is done via a vending machine at the entrance (this is entirely in Japanese but a lovely couple helped us ordering after seeing how lost we looked). You then quietly sit on a bench and when seats are free at the counter, you’re called up by the waiters – the slurping can then begin. I can’t quite explain how delicious this was – so intensely savoury, but also a fatty broth, thick chewy noodles, every bite as satisfying than the one before. Let me tell you a story. Upon our Airbnb host’s recommendation, we went for what claims to be the “best tonkotsu ramen” in Japan. Apparently people fly in from Hong Kong and Taiwan for a bowl of the stuff. The whole experience was surreal and slightly baffling. Unassuming from the oustide, this was a four-floor restaurant organised like a factory production line. You are asked if you want table or individual booth seating (more on that later), given a sheet on which you can choose every element of your ramen, like the richness of the tonskotsu, the strength of the fish stock base, the softness of the noodles, amount of their proprietary dry hot spice blend, garlic, and any add-ons. You are then ushered towards vending machines in which you have to make a ridiculous amount of decisions in a split second. Do you want a noodle refill? An egg? Sides? A beer? A matcha beer (don’t make this mistake)? Once we picked up our tickets, we were pushed towards a lift and somehow ended up on a different floor. We sat at our table and the ramen magically showed up minutes later. It was probably my favourite tonkotsu ramen, a perfect blend of richness and savouriness, slices of chashu pork soft and trembling, marbled with fat, and a salted egg. The hot spice mix provided a very subtle kick, but you can go all out and transform this into an eye-wateringly spicy soup. 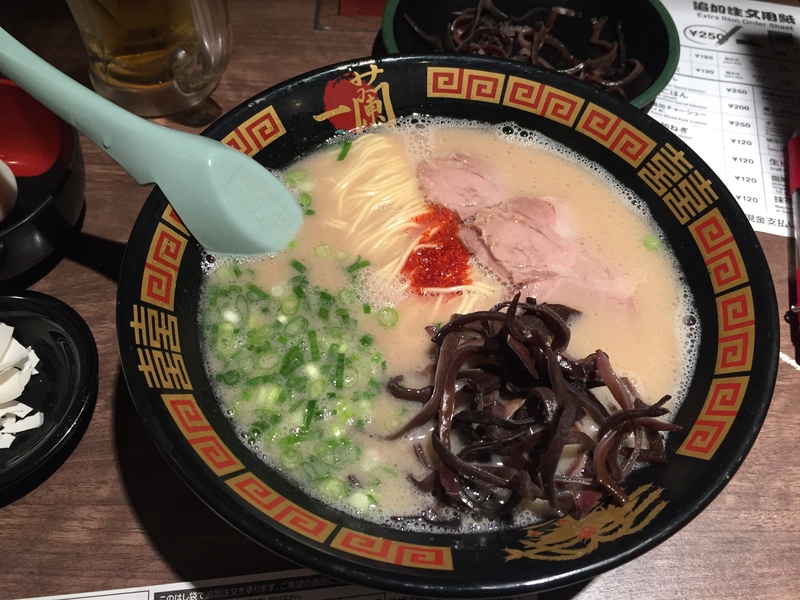 The following day, on the train to Tokyo, I couldn’t stop thinking about this ramen. Apparently simple, it clearly has an addictive quality and suddenly flying in from a neighbouring country for a bowl of the stuff seemed very reasonable. Ichiran is luckily a chain, and as soon as we got to Tokyo, we had it again. The Tokyo Shinjuku branch is smaller and less manic, which translates to a much longer queue. It also doesn’t have table seating, but individual booths only. It’s counter seating, but you have a panel separating each diner, and a panel separating you from the kitchen on the other side. This is raised while you’re been served, so you can see the waiter’s hands while they place your food on the counter – and then quickly pulled down to ensure absolute slurping privacy. Which you will absolutely need.